A true gentleman has left us. I shall miss Al's cheerful grin that was always sincere. Our loss is heaven's gain for now those who have gone before have a bass to round them out and add some depth to their celestial song. We have lost a great friend whose cheerful countenance and sometimes impish grin always brightened the day. We are all better for having known him and his indomitable spirit will always remain with us. Rest in peace, my brother. 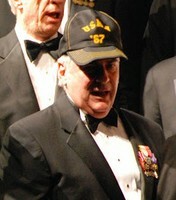 Al was a Classmate, a Glee Club member and a true Friend. Al was always there with a smile and an offer to help when help was needed. Al always went the "extra mile" if needed. Al is missed by all of us in the Class of 1967 and the Glee Club, but I'll bet his voice has already been welcomed by the "Celestial Glee Club"!